Winship Cancer Institute of Emory University is one of 500 centers around the world that will participate in a first-of-its-kind study to test a new drug on patients diagnosed with HER2 negative breast cancer and who also have inherited mutations in the BRCA1 or BRCA2 genes. The women and men who are eligible to participate in the OlympiA clinical trial will be considered to be at high risk for recurrence of the disease based on their stage or response to chemotherapy. Approximately five to 10 percent of breast cancers have inherited abnormalities in the breast cancer genes, BRCA1 or BRCA2, which help to repair DNA. Another protein called PARP (poly adenosine diphosphate-ribose polymerase) also helps repair damaged DNA. Olaparib, the drug to be tested in the OlympiA trial, is an FDA-approved targeted therapy for cancer that inhibits the action of PARP. Several studies in other cancers, such as ovarian cancer, have shown that olaparab is effective in patients with BRCA1 or BRCA2 gene mutations. The OlympiA clinical study is a randomized, double-blind, placebo-controlled phase III study investigating whether adjuvant olaparib can reduce the risk of breast cancer recurrence after standard therapy in patients with BRCA1 or BRCA2 mutations. Patients will be given either olaparib or placebo for 12 months. The patients will be followed regularly to ensure their safety and the follow up will continue for 10 years after the last patient enters the study. To learn more about the study contact the research study coordinator Chelsea Johnson at chelsea.m.johnson@emory.edu or view details online. Learn more about clinical trials at Winship. Learn about breast cancer treatment at Winship. 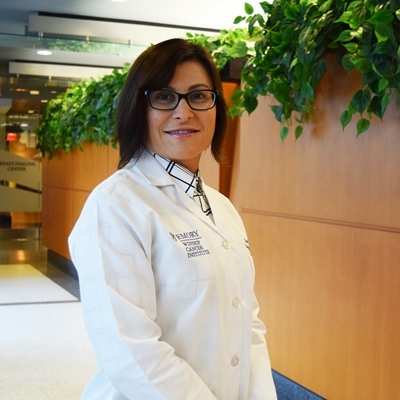 Pictured: Elisavet Paplomata, MD is the Principal Investigator of the study at Winship Cancer Institute.